I'm a teacher librarian. What's your super power? I was honoured to be invited to present about ‘Reading Promotion in the Library’ at the ALIA Schools Seminar: My country, my story: reading matters…. I teach 21 classes from Prep-Year 6 in the LRC each week. All classes have 45 minutes in which students borrow and I endeavour, depending on the year level, to share a story or teach a skill or teach an ongoing unit in that time…using every available minute! A few years ago I made a decision that literature would be the focus of library for the P-2 classes. Library time would be about sharing stories and most importantly reading would be fun. Each year when I speak to the new Prep parents I explain that we learn to read with our head and our heart and that a love of story is vital in learning to read. To a large extent classroom teachers focus on teaching the mechanics of reading (head). A big part of my role as a teacher librarian is to build on the love of story (heart) that students have hopefully brought from home. I try to do this by exposing them to a variety of authors, illustrators and book characters and encouraging students to express their feelings, thoughts and ideas in various creative ways about the books we share. 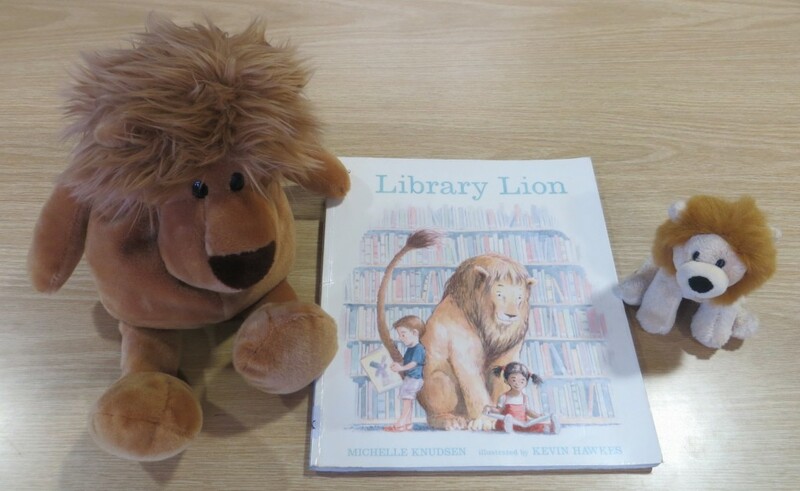 Our library is open before school every day for children to come and read with their hearts and their heads. As a teacher librarian, one of my favourite things about Twitter is that it has allowed me to connect with authors. I love reading about their latest books, following their book tours or what they might be writing about through #amwriting or simply enjoy reading their tweets. Some authors I follow and glean bits of information from their tweets and admire them from afar, but over the past couple of years I have connected with a few authors and even enjoy regular comments or chats with them. This naturally flows into my library classes and to our LRC Blog where I share tidbits of information with my students that in turn allows them to connect further with their favourite authors. After connecting with Felice Arena (@fleech) on Twitter and hearing him talk at a Professional Development evening earlier this year I was inspired to use my Twitter account to tweet comments from each of our Year One classes to him about his new Sporty Kids series. The students loved the fact that Felice tweeted back almost immediately and I think Felice was thrilled to hear from his readers! We have continued to tweet with Felice as he has released new books in this series and the students feel as though they know him and love borrowing his books. Little did I know that this Twitter connection with Felice (and my love of AFL football) would also lead to connecting with authors Michael Wagner (@wagstheauthor) and Adrian Beck (@adrianjbeck) and being asked if they could trial their brand new show ‘Kicking Goals For Readers’ at our school! This fabulous performance in our hall filled with 530 excited students from P-6 was a highlight of our year with footy, books and reading sharing the limelight! Just when I thought things couldn’t get any better, Adrian Beck returned the last week of term two to present me with a 2015 Indigenous football and suggested I might like to use it for a reading challenge. Before I knew it, Adrian had whipped out his phone to film a promo video for the “Yeo-low Medal”. This was to be our equivalent of the Brownlow Medal, but for the Best and Fairest Reader. I designed a Reading Scavenger Hunt based on a football field and the Yeo-low Medal was off and running with 205 students signing up. Adrian supported, encouraged and entertained us with videos along the way. Yesterday he came to school to draw the name of the winner and present our Yeo-low Medal. There were 57 students who had shown wonderful reading stamina over the term, hoping their name would be selected. Once again reading was the winner! On Thursday evening I attended my second inspiring author event offered by @thekidsbookshop. ‘A Celebration of Australian Picture Books’ brought together four talented picture book creators – Ann James, Anna Walker, Marc Martin and Jane Godwin. Their books are a joy to share with our students in the LRC so I knew I was going to be in for a treat! What does your work space look like? It was interesting to see each person’s work space. Both Marc and Anna travel to their studios, whereas Jane’s work space is at home and Ann’s was at her dam in Castlemaine! (she also works at her studio at Books Illustrated). Marc has quite a few other creative people working in a shared space. I love the light and airy feel of Anna’s studio. Jane explained she is very protective of her little space that she has managed to carve out for herself in her busy home. How did you become an illustrator or author? Both Anna and Marc began their careers as graphic designers and this background is evident in their work. Jane was working as a publisher for Penguin before following her own love of writing. Ann was an Art teacher who she said ‘spent many hours haunting The Little Bookroom and collecting picture books’. She entered some of her work into a competition with a publishing company and her dream to become a picture book illustrator began. What process do you follow in your work? Anna and Jane have collaborated on quite a few picture books including Today We have No Plans; All Through the Year and Starting School (they also have a Christmas book coming out in November). They both enjoy the shared experience of collaborating and creating the book together. Jane explained how she feels she has now come to the right place as a writer. As a writer though she has to remember that once she hands her story to Anna she has to ‘leave space for Anna to work’. As they work through the process some of the words will slowly be removed as the words and pictures come together to tell the story. I was really interested to hear this because I don’t think this level of collaboration between author and illustrator is the norm. Anna says that she sees a book as a film and tries to create a story that the reader can see themselves in. She is meticulous in the detail she uses to create her illustrations. When Anna was researching for the book Starting School, she spent a lot of time observing Prep students in the classroom so she could capture their mannerisms and make her characters easy for young children to relate to when reading. She also made each of the student’s uniforms – such patience! For her latest book, Mr Huff, Anna learnt stop motion animation so she could create her own book trailer. This Behind the Studio Door interview with Anna courtesy of Books Illustrated explains the process further. Ann explained that she prefers illustrating other people’s work. She likes collaborating with others, using a variety of mediums and growing through the process. Her recent use of mud to illustrate Janeen Brian’s books I’m a Dirty Dinosaur and icing to illustrate I’m a Hungry Dinosaur are evidence of both her creativity and willingness to experiment with different mediums. Marc has written and illustrated Max, A Forest and A River. He explained that it’s not the illustrating that takes the time but the ‘distilling’ of his ideas to get to the story and illustrations he wants to create. It took over twelve months for him to complete A River, but only 3-4 months were actually illustrating. (I really like the concept of ‘distilling’ as I think that’s how I do my planning for the library!) Marc was honoured when asked to illustrate Rudyard Kipling’s, The Jungle Book and was relieved when he could illustrate it in his own way. How do you feel when your book is finished? 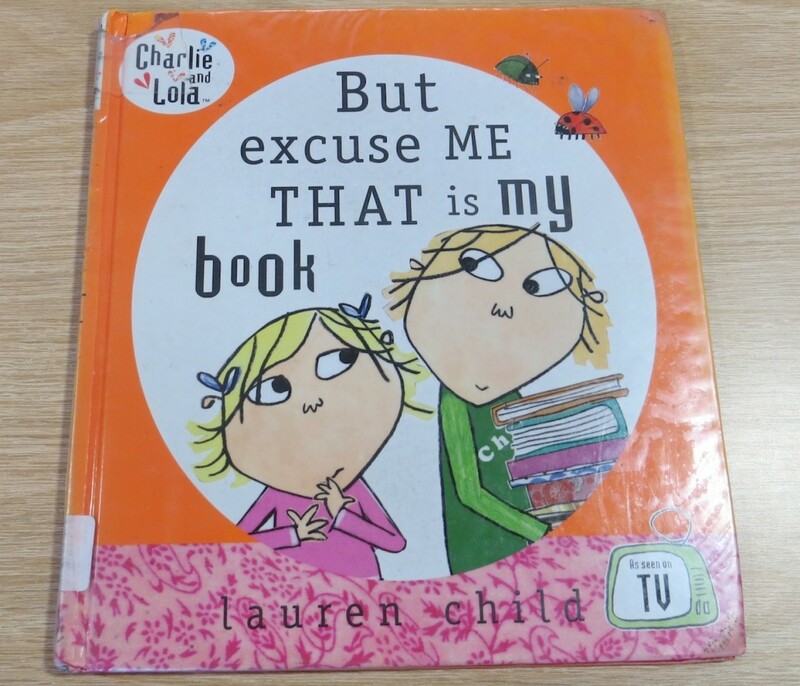 After fellow teacher librarian @SJbetteridge shared on Twitter today that she has started blogging at The Bookmarking Librarian, I came back to re-visit my neglected blog here. I found this blog post in Drafts that I had written back on May 4th!! 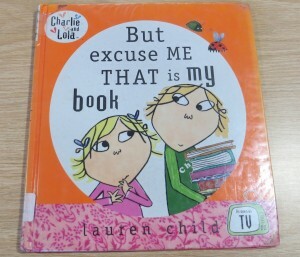 My excuse – it was a busy Term 2 and I tend to put my blogging energy into our school library blog. I’ll try to be more consistent this term…. What a treat to attend the Finding the Enthusiastic Reader in Your Reluctant Reader evening offered by The Kids’ Bookshop last Thursday evening. It was such a valuable opportunity to listen to three highly respected and popular children’s authors – Sally Rippin, Felice Arena (@Fleech) and Michael Wagner (@wagstheauthor). Don’t lose the oral tradition of storytelling – so powerful! See Sally’s “Story Peddlers” initiative bringing back the art of the roving storyteller with pop-up performances on a bike! The new insights I have gained into these particular authors and their books are invaluable. They empower me in my role as a teacher librarian to help connect our readers to books that are the ‘right’ book for them to help them on their journey to become lifelong readers. It was also a delight to meet both Felice and Michael face to face and not be limited to the 140 characters we often converse in on Twitter. I’m cheating a little by copying this blog post from our LRC Blog, but thought it was also valuable to share here. I have begun each year reading the same books to the Preps for a quite some time now. These books help set the tone for our library, the importance and joy of reading and allow us to have fun with books. What is really lovely though is that they also provide a shared whole school experience that I witnessed last week when I overheard one of our Preps asking their Year 6 Buddy if they “eat words with their eyes’? 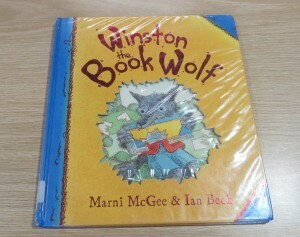 Their Buddy replied “Has Miss Y read you Winston the Book Wolf?…. I call this story an “oldie but a goodie” which means it’s an old book, but it is a great story and is lots of fun to read. It is called Walter’s Wand. 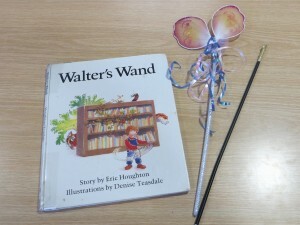 Everyone enjoys waving their wands and saying Walter’s magic words as we read the story and see the tigers, pirates and oceans come to life in the library. 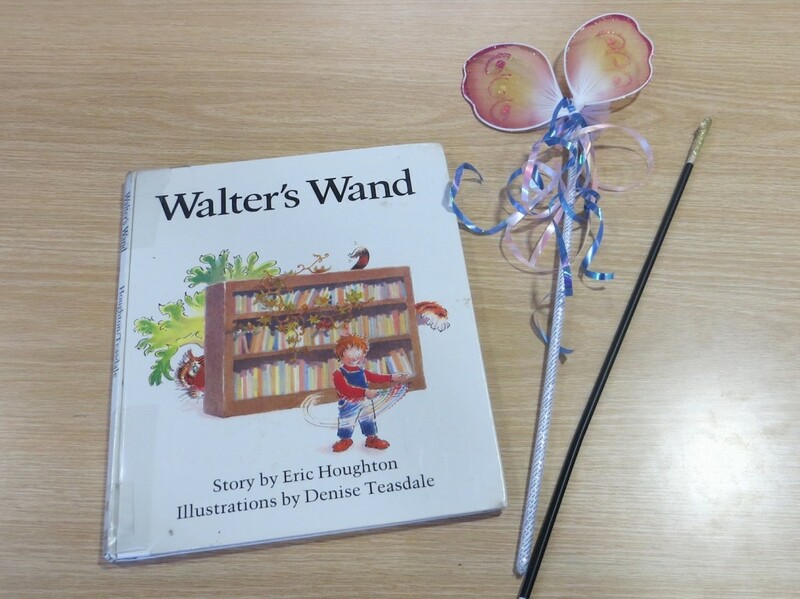 The best part is after people scan their books they use one of Miss Y’s wands to tap their book and say their magic word… and wait to see if their magic has worked when they read their book at home! When everyone looks at the cover of Winston the Book Wolf they are surprised to see a wolf eating a book with his sharp teeth! Winston LOVES words but he thinks he has to eat books with his mouth to taste them. Luckily Rosie teaches Winston that he can still taste his words if he eats them with his eyes because “when you read you eat words with your eyes!” Thank goodness our students do this or we would have lots of books in our library with big bites taken our of them! Which one of these stories is your favourite? My first week back in our LRC was both a delight and very busy! I hit the ground running seeing all of the Year 1-6 classes where we caught up on news, mine and theirs and managed to fit in some borrowing! I loved hearing about new family members both human and pets; sporting achievements; family holidays; new homes; broken limbs and various stories that 45 minutes allowed. In return I shared my Gap Year in 2014 with many classes sitting with bated breath as I described climbing the Sydney Harbour Bridge. We also had a great discussion about our LRC having its own distinct ‘library smell’! I knew there would be some adjusting on my return, but my “attitude” had its first challenge when I read my timetable and discovered not only was I teaching my regular 21 library classes BUT also teaching ICT for the three Year 6 classes. I was most upset I had not been part of the discussion and seriously wondered how I could take on another 3 classes and still manage the library with even less time…I guess I will know by the end of Term One. Over the past twelve months I have been reading and following closely the Canadian Library Association who are transforming their libraries into a “Learning Commons”. I dream of our library being a hub of learning both physical and virtual in our school, where I am not tied to a fixed timetable; I collaboratively plan and teach with other teachers; we utilise a range of technology and books in our flexible space and both myself and the library are integral parts of a vibrant learning community. I know becoming a Learning Commons is a long way off and would mean a huge culture change at our school beginning with the teacher librarian not being used to provide release time for classroom teachers…sadly, I know this will probably never happen. In January, 1985 I began my teaching career. It was 6 months before I turned 21 and I was a newly minted teacher of 35 eager Year 3 students, (three sets of twins, two sets were identical!). I won’t ever forget that mixture of nervousness and excitement as I stood in front of my class, my new “family” for the first time. For me, like many teachers, our students become our family for the year they are in our care. As a teacher librarian my student family is much larger and our relationship extends over seven years. On occasions when I’m asked how many children I have, I delight in saying 520 and watching the look of horror, amazement and disbelief on people’s faces until the penny drops! However, it is true – my students are family to me. Before school started Riley now in Year 2, burst in to give me a hug and in his deep little voice said “Welcome back Miss Y!”. He had been in Prep when I was last in the LRC. Riley comes from a ‘book family” and we connected through our love of books and our shared sense of humour. He was regularly in the LRC and it became his haven as he settled into school life. Molly, his little sister who is starting Prep on Monday (and is no stranger to out LRC) came to say hello too. Riley proudly told me he had now read all of Andy Griffiths’ Treehouse series and we were both excited that each of us had met Andy last year! Before they left, Riley’s mum whispered to me “I thought you’d like to hear this…when we in the car this morning Riley said “You’re so lucky to be on Prep this year Molly because you will have the best librarian in the world!” As my eyes filled up it was a powerful reminder of the connections you make, the effect you can have as a teacher and the responsibility you carry with you…as well as lots of pressure to live up to Riley’s words! Next visitor mid morning was Jack who is now in Year 8 and was in helping our PE teacher. He came through the door with a huge smile and a ready hug. “I heard you were back Miss Y and I came to say hi”. For the next 15 minutes we had a great chat about what he enjoyed most in Year 7 last year, his favourite subjects and teachers. Jack is a “Specky Magee” type of boy so we talked about the footy that we both love and his basketball and laughed that some of the older boys at school had according to Jack “more hair on their legs than he did on his head”. We also talked about books he had read including “The Boy in the Striped Pyjamas” and I asked if he now understood why I didn’t buy the book for our LRC and left it for them to read in secondary school. It was as though time hadn’t passed and it was wonderful to see how one of the seeds was growing and flourishing at secondary school. At recess there was a knock on the door and Joshua, a quiet and gentle Year 5 boy came in with a new class mate he was showing around. “I wanted to show Louis our LRC and for him to meet you Miss Y”. After a little chat it was a revelation as Joshua showed Louis around and I could overhear his explanation of parts of the LRC including the Story Chair and Story Keeper, showing Louis different books and authors and explaining how we do things in our library and some of the things we had done to celebrate reading. As I listened quietly to Joshua, I could hear the reading culture of our LRC being passed on…more seeds I had planted were growing. At lunchtime Oscar who is now in Year 6 came to give me a welcome back hug and said “Miss Y, I’ve come to ask for your help.” Oscar can be a serious boy and he is a real thinker. He explained now that Miss K had left there was no one to help with Chess Club and Oscar had obviously been thinking about this. “You were the first person I thought of who could help.” I said was very honoured to be asked, but I couldn’t play chess! Not a problem for Oscar who explained all they needed was a place to play chess and a teacher to supervise and he would organise the tournaments. We had a chat about some possibilities and Oscar left looking relieved. Our many chats over the years often before school in the LRC about various books and topics of interest to Oscar have earned me his trust and respect and I value that. After school I could see a small group of Year Three girls huddled at the LRC door and then I heard them reading in unison the ‘When you enter our library..’ sign on the door followed by a comment, “That is so beautiful!” They then excitedly popped in to give me a welcome back group hug. Again another great chat about books, holidays and everyone getting taller but me! They were excited for library to begin next week. The connections we had made were still there. Connecting with my students has always been a priority for me as both a classroom teacher and a teacher librarian. If there is no connection there will be no real learning. It can be a challenge to get to know each student when you teach 520 students, but after 12 months away from the LRC, these moments on the first day reinforced for me the importance and power of making those connections and they also gave me a wonderful glimpse into how some of the seeds I’ve helped plant are growing. This week lessons in the LRC begin for our 21 classes. Time to plant seeds and make connections for another year…but this week there’s no formal lesson because we need to reconnect first before we can begin our year of learning! When I walked into our LRC on January 6th it very much felt like I had returned home after a long holiday! The smells were the same and the layout of the library was pretty much as I had left it. However, as I sat at our Borrowing Desk I wondered if it was time to make some changes. A week later I returned and to my horror everything had been moved to clean the carpets and nothing had been put back, including the three heavy Fiction shelves on wheels that had been “strategically placed”! Next came cleaning and wiping down walls, the Borrowing Desk and the tops of benches in the workroom. I removed posters from the Borrowing Desk and LRC front doors so there was a clean slate ready for a new year. Before I continued getting the LRC ready, my next focus was organising Bulk Loans for 21 classrooms. These loans consist mostly of Picture Books for Year P-3 and some Non Fiction books are added for Year 4-6. This is quite a long process as I choose books carefully based on the year level; time of the year; authors/illustrators I’ve shared with the level as well as noting each level’s Inquiry and Wellbeing topics. The Bulk Loans are changed at the end of each term and teachers are welcome to change or add to them throughout the term. The Inquiry Loans for the seven year levels that I need to do can wait until I meet with teachers later this week. With Bulk loans done and piles of Picture Books removed from the tops of shelves, I could now organise the Picture Book area to create an inviting space. I have bought quite a few book character toys and these are now happily sitting on the top of the shelves with their matching book. Lots of Picture Books are displayed on the front facing shelves to tempt readers. Junior Fiction is a popular and busy area and I noticed quite a few series were added last year. I may have to do some re-thinking about it this year, but for now it’s ready for borrowers. We have three display boards in our LRC. I’ve left the small one with it’s current display and the large one is ominously empty for now, but I want it to feature student work over the coming weeks. That left me with the middle landscape board that I decided to use for our theme of “Connect” in the LRC this year. An illustration from Peter Reynolds on Twitter was my inspiration and with the help of a trusty overhead projector (worth it’s weight in gold to non-artistic people) I created our KISS (Keep It Simple Stupid) display. I have some words I want to add to the display and students will add pictures, but it’s still a bit “open-ended” at the moment. However, after posting a thank you on Twitter to Peter Reynolds for his inspiration for our display I now feel under a tad under pressure after his response!! The front reading area at the entrance is ready with Picture Books about Australia and is waiting for it’s turn to shine for “Library Lover’s Day” and the Non Fiction area is armed with popular books on display. Everything is not as completely ready as I would like, but this year I’m saying “That’s okay”. As with classroom teachers, teacher librarians have a lot to organise and get ready at the beginning of the year. However, it’s not one class that we focus on, but the whole school. Our library spaces are our classrooms, that are highly visible and need to welcome, inspire and cater for the needs of the whole school community. As a teacher librarian, my beginning of the year involves juggling the organisation of the library, managing resources to ensure classroom teachers are prepared to start their year, as well as doing my own preparation and planning. It’s such a hectic time and I feel like a swan – trying to look as though I’m calmly gliding across the water, but my feet are paddling like mad under the water to keep me afloat (and not always successfully)! We have two staff Professional Learning days and our students start back on Friday, January 30th before library classes begin Monday, February 2nd at 9.10am…bring on 2015! As a teacher librarian, this quote resonated strongly with me when I saw it on Twitter. It comes from the article “Why We Need School Libraries” by Alan Gibbons an English author of children’s books and an educational consultant. Alan is a passionate advocate for reading and the vital role of libraries and teacher librarians. I am incredibly fortunate to work in a brand new school library that was built with the BER funding. We moved from a 28 year old, tired, double portable classroom into a large, bright, open and modern space. Even though the two library spaces are in total contrast physically, their essence is the same. Both libraries have been much more than a room; they have both maintained a strong relationship with students, staff and parents and each library has encouraged, nurtured and valued a culture of reading at our school. The vital link between the two libraries is that there has always been a teacher librarian. My principal values reading highly and as a result our primary school has a library and even rarer, a full-time teacher librarian. However, in the current climate I often find myself wondering what would become of our library if in the near future we have a principal who decides the school doesn’t need a teacher librarian. Instead, the classroom teacher takes the class to the library for borrowing once a week. Will our library still be a vibrant and welcoming space that is a celebration of books and reading and a place of creativity, inquiry and learning or simply a room full of books? Will the culture of reading we have developed be maintained? What impact would this have on learning at our school?